These restaurants serve them hot and fresh. Best of all, you get a warm bowl of soup for free! People generally don’t like rainy days. The gloomy weather makes us feel lazy—you just want to bundle up in bed and sleep in until the rain lets up. On the bright side, eating comfort food like stew or a warm bowl of soup is much more satisfying and rewarding when it’s raining and pouring outside. If you're hankering for a hearty dish to counter the rainy day blues, you're in luck: not only did we round up the 10 yummiest Pinoy comfort foods that are perfect for the wet weather, but we also included the restaurants around the country that serve them best. Here’s a tip: Visit them from September to October, order of their featured stew servings below, and you can get one of their tasty soup dishes for free with the Masarsabaw Promo. Rainy days just got better! If you're ever up north, make sure to visit 3G Panciteria in Candon, Ilocos Sur. Though known for their pansit and catering services, it's also a great place to get your fill of Ilokano favourites. Their Pinakbet is definitely a must-try: perfectly seasoned and packed with vegetables, this healthy, comforting dish is best savored while warm. 3G Panciteria is located at National Highway, Candon City and Ayusan Sur, Sta. Lucia, Ilocos Sur. It’s open every day from 7:30AM to 8PM. While we agree that nothing tastes as good as your mom's Adobo, Bulaluhan sa España's rendition comes a close second. the meat is impeccably tender, and the slivers of siling labuyo adds a hint of much-needed heat to the classic dish. Bulaluhan sa España is located at España Boulevard and Josefina, Sampaloc, Manila. It’s open 24/7. Pan de Cielo started as a bakeshop in 2011, serving brick oven-baked toasted siopao, hot pandesal, and other tasty pastries. Now it’s a family diner, offering innovative dishes like kinalas, pancit bato, and paksiw naga. If you’re craving for a flavorful dish with lots of texture and ingredients, order their Callos: it's packed with chorizo, ham, bacon, olives, cheese, carrots, potatoes, beef tripe, and ox feet, stewed in savoury tomato sauce. Pan de Cielo is located at 3511 P. Sanchez Street, Barangay 602, Santa Mesa, Manila. It’s open Mondays to Saturdays from 10AM to 9PM. Named after the famous house help of Doña Delilah in the ’80s comedy show John en Marsha, Matutina’s Seafood House serves marine bounty alongside a wide variety of Filipino dishes like pinakbet and deep fried liempo. 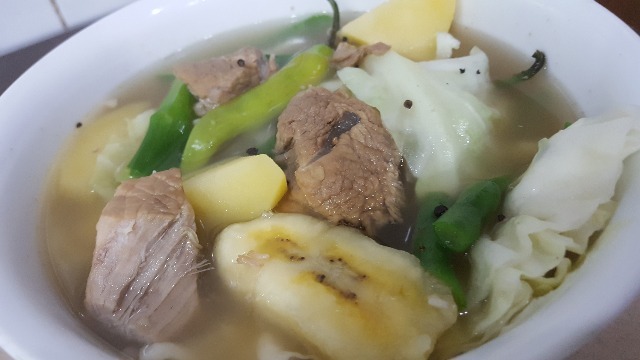 But for a rainy day, nothing livens up the tastebuds and warms the belly better than a steaming bowl of tender beef nilaga, which is one of Matutina’s bestsellers. Definitely a must-try! Matutina’s Seafood House is located at Nancayasan, MacArthur Highway, Urdaneta City, Pangasinan, and Bonuan Tondaligan, Dagupan, Luzon 2400. It’s open every day from 7AM to 10PM. If home-cooked Kapampangan fare is your kind of comfort food, head to Teresita’s, an affiliate of the legendary Teresita R. Razon’s Halo-Halo and Palabok in San Fernando, Pampanga. 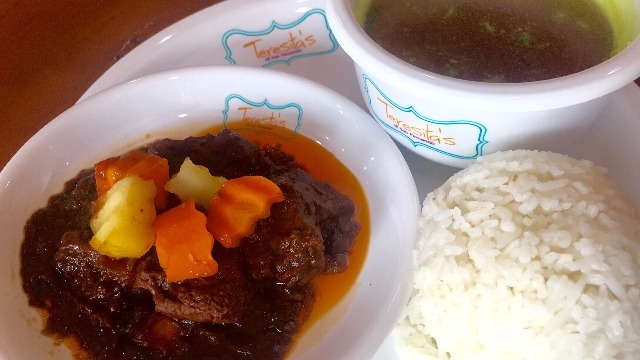 Their tender beef kaldereta is, hands down, one of the best recipes in the metro! 220 Alfredo's Building, De Guia Street, Tomas Morato Ave., Quezon City; GF Waltermart North EDSA, North 8001 A. EDSA Veterans Village, Quezon City; Level 3 Festival Supermall, Filinvest Alabang; 2F Light Mall, EDSA cor. Madison St. Brgy Barangka Ilaya, Mandaluyong City; Lower Ground Floor SM Southmall, Alabang-Zapote, Almanza Uno, Las Piñas City; and Vito Cruz St., Malate, Manila. Sangkalan's version of this simple but filling soup is hard to top. 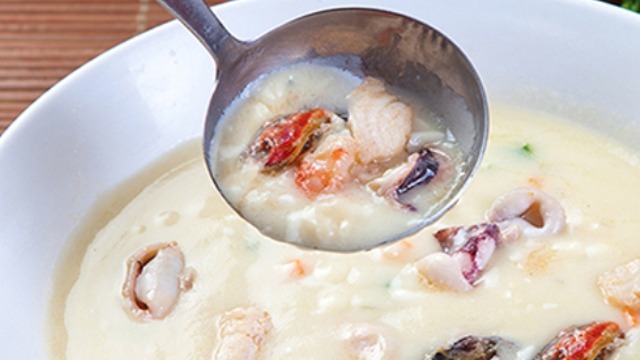 Rich and flavourful, with a generous helping of seafood, it's the perfect stomach-warmer for rainy days. Order it alongside other Sangkalan bestsellers like the Crispy Tiyan ng Tuna and the Boneless Daing na Bangus. Sangkalan Grill and Restaurant is located at 7 Scout Albano, Diliman and at 25 Visayas Avenue, Quezon City. It’s open every day from 11AM to 12MN. 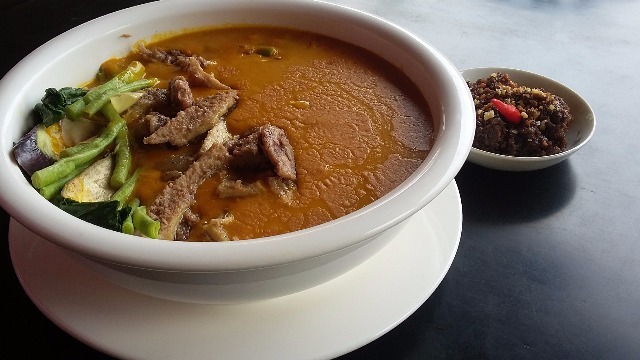 Kare-kare is a rich and thick peanut-based stew with oxtail, tripe, and a variety of vegetables best served with fresh alamang and a steaming cup of rice. The peanut flavor and the saltiness of the alamang complements each other, with every bite giving you instant food gratification. If you want to enjoy this dish and have a different dining experience, visit Balsa sa Niugan, a floating restaurant situated on a tranquil palaisdaan where diners can eat on floating bamboo rafts. It's a distinctly Pinoy culinary adventure your tastebuds won't easily forget! Balsa sa Niguan is located at 3 M. Aquino St. Niugan, Malabon City 1470. It’s open every day from 11AM to 12MN. 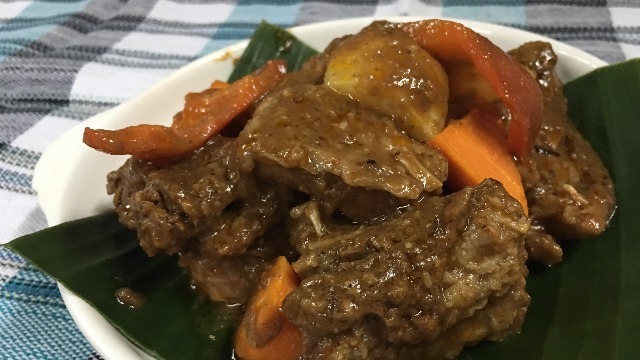 If you’re in Bulacan, drop by Buslo Sizzling and Bulalo and order their Calderetang Baka. Their version is an extra-hearty dish, complete with red bell peppers, carrots, potatoes, and melt-in-your mouth beef pieces. It's so flavorful, once you eat it, you'll stop worrying about those rainy day blues! 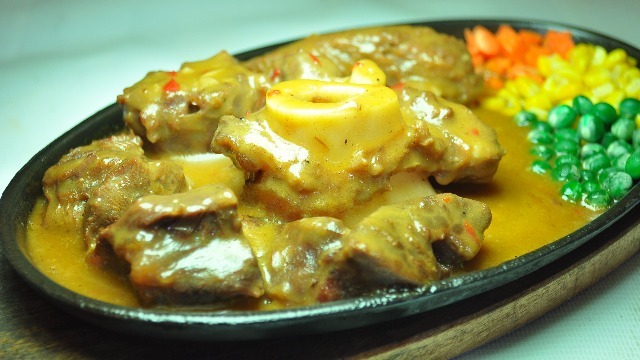 Buslo Sizzling and Bulalo is located at McArthur Highway, Guiguinto, Bulacan, and at McArthur Highway, Bocaue, Bulacan. It’s open every day from 7AM to 2AM. Marinated beef stew in soy sauce and lime, garnished with onion rings, and served with hot rice—you’ll forget about being cold once you have your fill of good beef steak. Try the version at Casa Pollo, a family-owned restaurant in the heart of South Cotabato that specializes in non-pork dishes. Their patrons also highly recommend the balbacua, calderetang kambing, sinigang na bangus, and langka salad. Casa Pollo is located at P3A L1 B13 DSS, Soledad and at Miranda St., Polomolok, South Cotabato. Tasty beef marrow on a sizzling metal plate topped with creamy gravy? Yes, please! 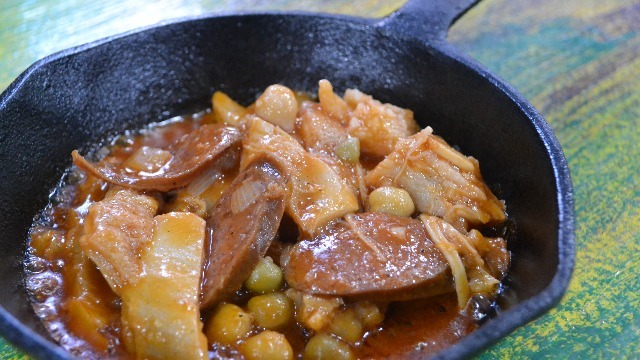 Sizzling pochero is an innovation from the usual soupy pochero, another heartwarming dish. 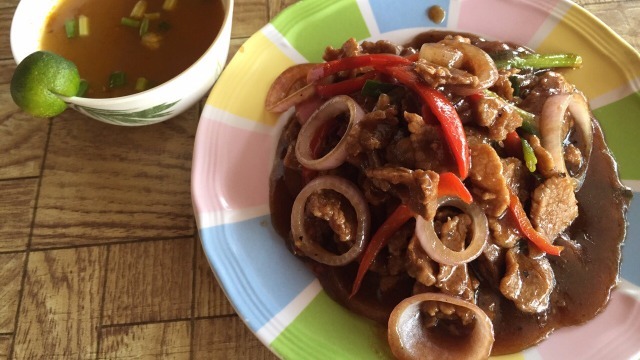 For one of the best versions of this sinful dish, head to Barcode in Zamboanga City. The gravy makes all the difference: If it’s too salty or overpowering, you won’t enjoy the meal as much, but at Barcode, it's just right. Locals also love the restaurant’s tiula itum and beef culma. Barcode is located at Paseo del Mar, Zamboanga City, Mindanao. It’s open every day from 7AM to 10PM.